Making money online doesn’t need to cost you an arm and a leg in advertising costs. Actually it doesn’t have to cost you anything at all! All of the major search engines are now giving natural search rankings to websites with quality and freshly updated content. 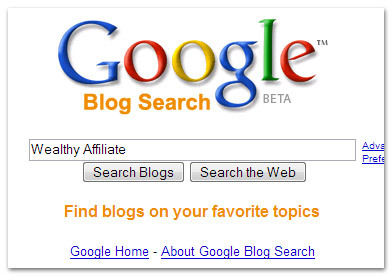 So, if you want to get free natural listings in Google, Yahoo, MSN, and other search engines, all you need to do is learn how to become an efficient article marketer using Squidoo. This tutorial focuses on using Squidoo.com to quickly build articles (or "lenses" as Squidoo calls them) that can earn you $1,000s without having to spend a dime in advertising. You’re going to learn exactly why Squidoo is so strongly recommended for article marketers, how to master the tools available to you at Squidoo, and most importantly how to optimize your Squidoo lenses so they get picked up by Google! If you have read through the success forum at WA, you will see many stories of members earning thousands of dollars a month essentially for free! 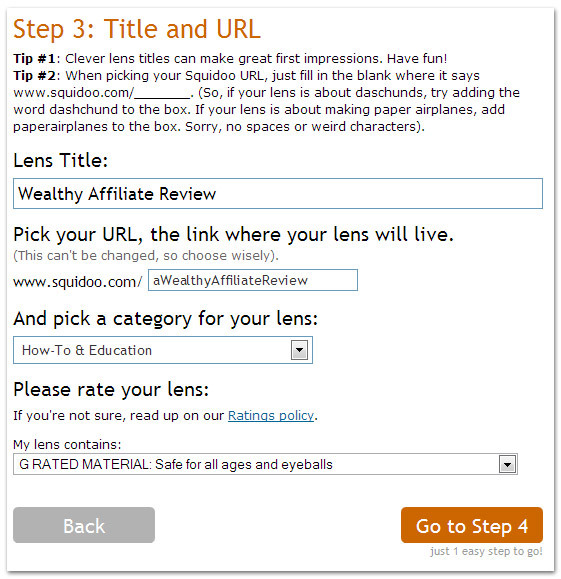 Article marketing with Squidoo is a great starting point for any marketer! It can help you earn seed money that can then be spent on other components of your business (like PPC) or allow you to earn a continual stream of income from your articles. 2 – Click on “Sign Up” in the upper right-hand side of the page and follow the instructions to open your account. You can literally write about anything that you want in your lenses as long as you don’t break Squidoo's terms of service (adult content, spam, fraud, etc.). The “KEY” to creating a successful and highly visited lens, is to target search terms that are not highly competitive within the search engines. Details of how to find these keywords are given in our full guide and tutorial on Article Marketing. A Squidoo article, or “Lens” is created by piecing together “modules”. In this tutorial we will focus on the most useful modules for affiliate marketers. These are the Introduction, the “Text / Write” module and the RSS Feed Module. Introduction Module: This module will be present on all of your lenses and is very important. The Introduction Module allows you to add an image by simply uploading from your computer. Click the “Browse” button to add a relevant image for your lens. A product screenshot is always a good option! Text / Write Module: The Text / Write module is the most common module that you will use as an article marketer. It allows you to have a headline, text, images, and to add HTML links. Optimization Tip: We suggest that you use multiple Text / Write modules to build your lenses, rather than using just one. One reason for this is that headlines and breaks in text will allow the reader to quickly scan your page without having to read every single word. It will allow you to utilize Optimized Headlines to grab the attention of the visitor! Another reason for multiple text modules is that, to stop spammers, Squidoo now asks lensmasters to have at least 4 lens modules. You can publish a lens with fewer modules but it will only achieve a very low Squidoo rank. Here is an example of what your page could look like with a few Text / Write Modules. 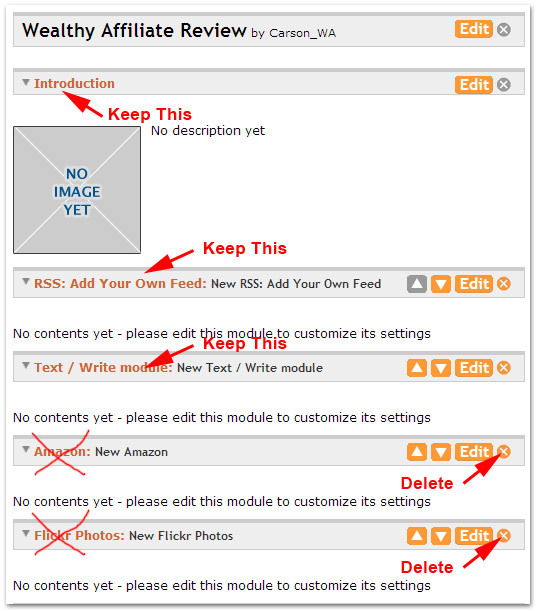 RSS Module: Adding an RSS feed to your module keeps the search engine "spiders" coming back to your page over and over again. This is because an RSS feed keeps the content FRESH. 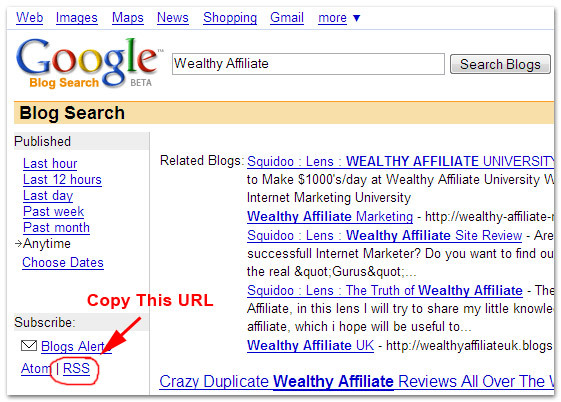 So, adding an RSS feed module to the bottom of your lens can really help with your search engine rankings. 3 – On the results page you’ll see an “ATOM” link to the left of the results. Right Click, and copy this link. 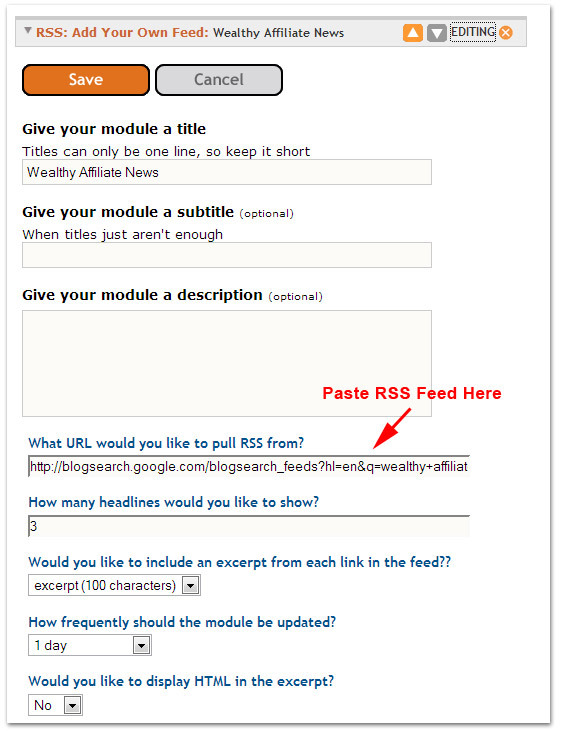 4 – Use this link in your Squidoo RSS Module where is asks you where to pull RSS from. 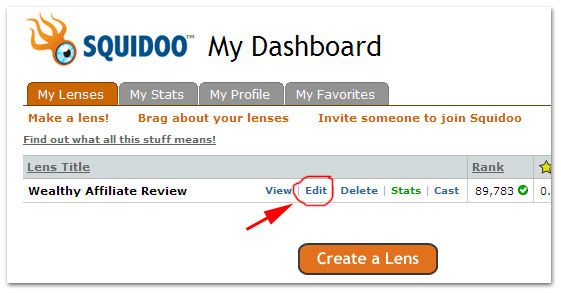 TIP: If you have your own blog, you can add your blog posts as an RSS feed to your Squidoo Lens too. If you use Blogger.com, visit your blog in your browser then copy the link at the bottom left hand side of the page where it reads "Subscribe to: Posts (Atom)". When it comes to optimizing your Squidoo Lens (or any other article that you write), you should go about it in the same way as you would when building a landing page. Remember, you should optimize your lenses in just the same way as a web page. 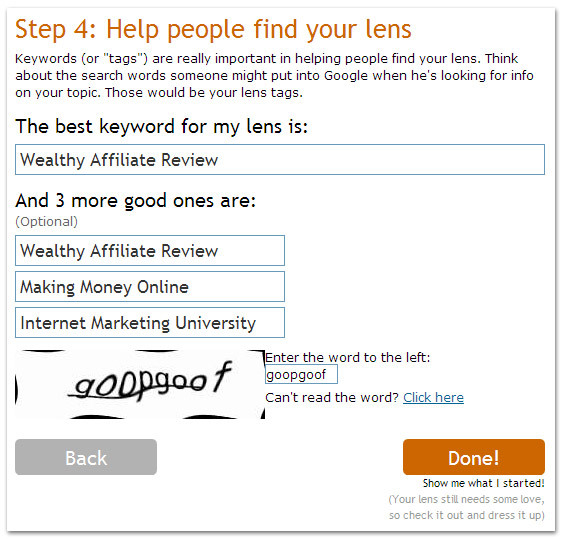 Squidoo allows you to use something called “Tags” to describe your lens, and this is one reason why Squidoo articles get picked up by the Search engines under the keywords that you choose to write the article about. In many cases, you can get a listing under a keyword that you have in your tags, and not even within the lens content itself. Adding tags is one way that you can utilize the power of Squidoo. To update your tags, enter “edit mode” for your lens, then scroll down the right-hand side to the “Tags” section. Click on “Edit”, and add some more highly relevant keywords to the list. 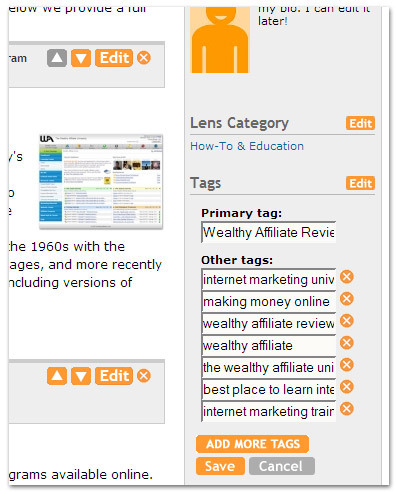 Example: If you wrote an article that focused on the keyword “Wealthy Affiliate Review”, then you may want to add the following keywords to your “Tags”. There is much debate about whether you should “Max” your lens or not. From an Internet marketing perspective, maxing your lens does nothing but take focus away from the content of your lens. 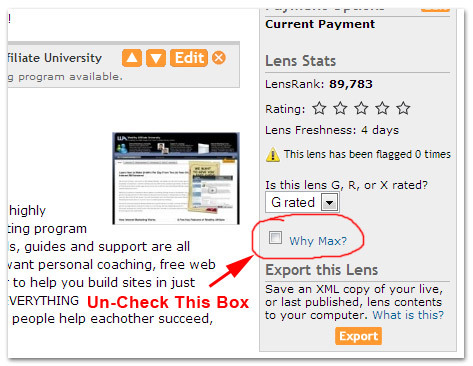 You want your visitors to focus on the main content of the lens, and this is why we recommend you “Un-max” the lens. To do this you simply log into your Squidoo account, and click “Edit” on the lens you want to un-max. Scroll down the right hand-side menu and under “Lens Stats” un-check the “Maxed” box. Using Squidoo can make you thousands of dollars a month in pure profits, but you cannot expect to earn money from every single lens that you create. We suggest that you create yourself a manageable set of weekly tasks and use them to stay on track. You need to pump out as many quality lenses as you can each and every week. Some articles may get picked up in the search engines immediately, while others may take months, but the more you have out there, the more free traffic you will receive. Each Sunday make a list of 10 lenses that you want to build in the coming week. It will only take you about 10 minutes to come up with a list, including the exact keywords and phrases that you want to target with your lenses. Each day of the week you should be aiming to write the text for 2 Squidoo lenses. Many of you will have full time jobs, but if you can write a 300 – 400 word article during your lunch break everyday based on the list you created at the beginning of the week, you will be in great shape. That’s 1 article done for the day. When you get home, spend another 20 minutes to build the article into Squidoo using the techniques we’ve discussed in this tutorial. 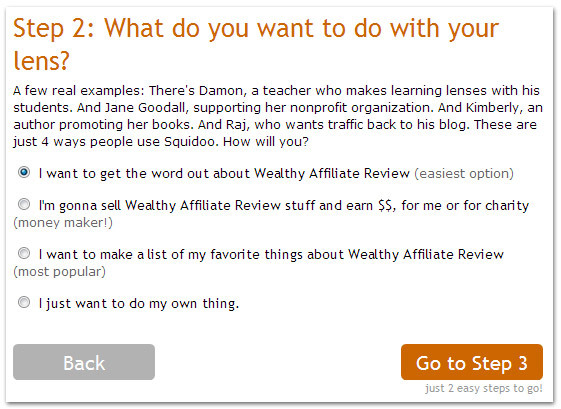 Using Squidoo is a very good way to create an income stream online that does not cost you anything but your time. Treat Squidoo like a hobby, follow a schedule, and optimize your lenses using the techniques we’ve discussed in this tutorial. Marketing with Squidoo will allow you to earn money which can be invested to further expand your business, or used to take advantage of paid techniques like pay-per-click marketing.